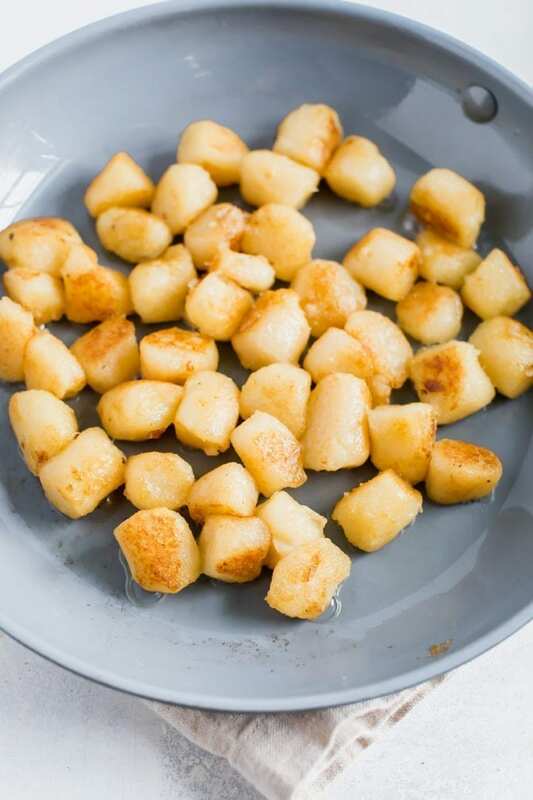 Looking for more ways to turn the Cauliflower Gnocchi from Trader Joe’s into a meal? 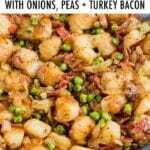 Try this pan roasted cauliflower gnocchi with onions, peas and turkey bacon. I think I’ve found my new favorite way to eat the cauliflower gnocchi from Trader Joe’s. It’s a super simple combo, so flavorful and easy peasy to whip up. What more could you ask for? 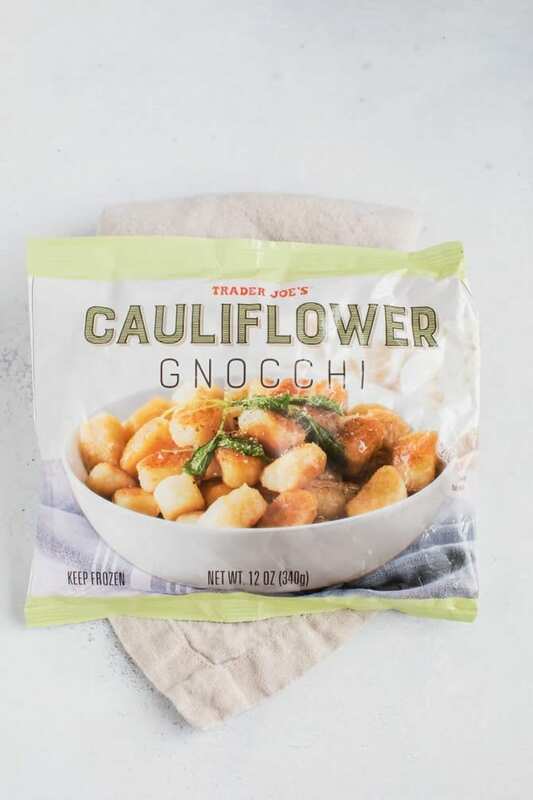 A little backstory… last year around this time Trader Joe’s launched their cauliflower gnocchi and the world has become obsessed. I’m honestly not a huge gnocchi person so this product didn’t excite me much, plus it was always sold out at my local store so I was super late to the cauliflower gnocchi scene. That said, I finally had a chance to try it last year and based on warnings from other cauliflower gnocchi fanatics I didn’t follow the package instructions. The package mentions boiling or microwaving the gnocchi and adding water if you pan-sauté them. Do NOT follow these instructions. You’ll end up with mushy, sticky cauliflower gnocchi and it will be sad. So far the best way I’ve found to cook the cauliflower gnocchi is to pan roast it in a little olive oil or butter. The first time I made the cauli gnocchi I pan roasted it with butter and served it with Rao’s homemade pasta sauce. It tasted totally fine, but I wasn’t blown away. Isaac on the other hand LOVED it and couldn’t stop raving about how much it tasted like regular gnocchi. Needless to say, I knew I needed to find a way to cook cauliflower gnocchi that both Isaac and I would enjoy. 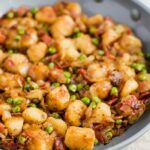 This pan-roasted cauliflower gnocchi with onions, peas and turkey bacon totally fits that bill! 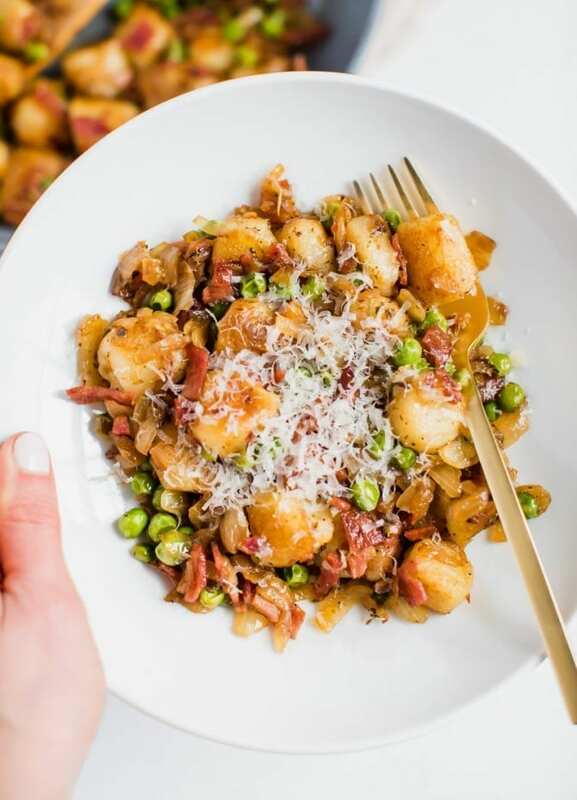 I love the combo of the pan-roasted gnocchi with the caramelized onions, sweet peas, savory and crisp bacon and the parm. These things are all great on their own, but they’re so amazing together. Now that I’ve found one way that I really enjoy the cauliflower gnocchi, I’m excited to experiment and try some different preparation techniques. 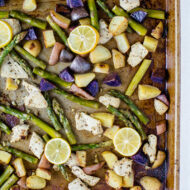 I’m thinking I might try a cauliflower gnocchi sheet pan dinner next! If you make this pan roasted cauliflower gnocchi recipe, be sure to leave a comment and star rating below letting me know how they turn out. Your feedback is super helpful for the EBF team and other EBF readers! 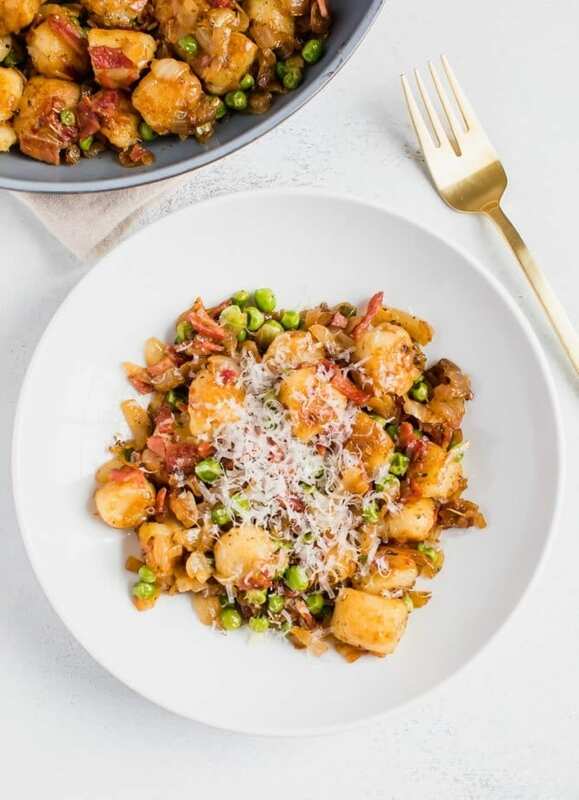 Turn Trader Joe’s cauliflower gnocchi into a quick weeknight meal with onions, peas and turkey bacon. Cook turkey bacon using instructions in the notes. Once cooked, chop the bacon into small pieces and set aside. Meanwhile, heat 2 Tablespoons of olive oil in a large skillet over medium-high heat. Add the chopped onions and cook until they begin to brown, 3 to 5 minutes. Season with salt and pepper to taste, reduce the heat to medium and continue to cook, stirring occasionally, until the onions are golden brown and almost caramelized, about 10 minutes more. At this point, stir in the frozen peas and Italian seasoning and transfer to a small bowl. Using the same skillet, add the remaining 1 Tablespoon oil over medium-high heat. Add the frozen cauliflower gnocchi and cook, tossing occasionally, until they’re lightly brown on all sides, about 5-10 minutes. Gently add in the onion mixture, chopped bacon and parmesan. Serve warm, sprinkled with additional parmesan. Inspired and adapted from Fine Cooking. Bacon makes everything better! 🙂 I will definitely be trying this soon! Hopefully I can find the gnocchi at my local Trader Joe’s! Do NOT use a non-stick skillet for the gnocchi. After 10 minutes, it will be mushy and sticky and not brown at all. Follow Brittany’s photos and don’t make my mistake! So far, everything else seems to be going well with this recipe. hmm! What kind of pan do you recommend? I used a ceramic non-stick pan it worked great. 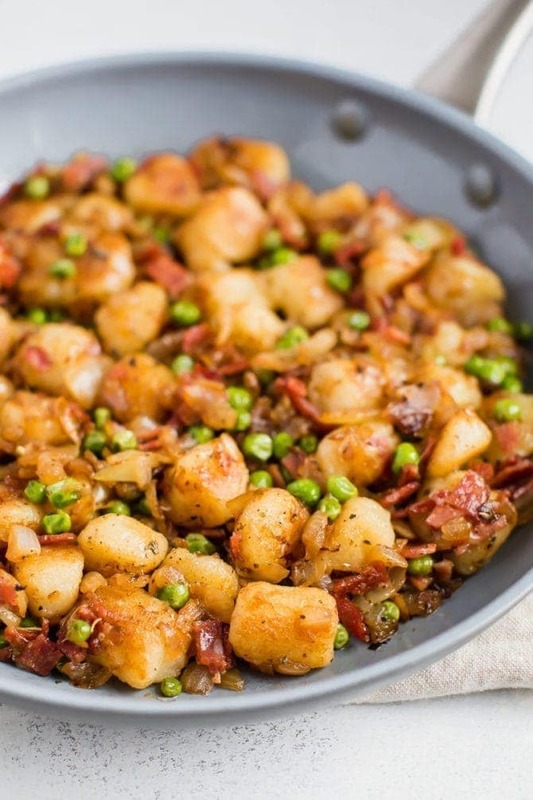 Use a well seasoned cast iron skillet browns up the gnocchi perfectly. Cauliflower or potato. What kind of pan did you use? I used a non-stick pan. Made it last night and it was delicious! I doubled it so that we could have it for lunch today too. Tastes like a healthier version of carbonara. I made this recipe last night and it came out so good! The flavors are great together, and it was quick and easy for a weeknight meal. My boyfriend loved it too! 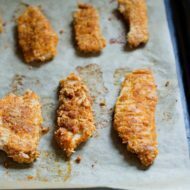 Simple, easy, and tastes amazing! I substituted the turkey bacon for regular bacon and had to leave out the onions due to an allergy (substituted onion powder) and it was so good! Needless to say, there were no leftovers! This is easy and quick – perfect for busy days. I didn’t tell my husband about the cauliflower until after he had a few gnocchi. Generally he is not a fan of cauliflower but he has been talking about how good this dish was for days. Yay! 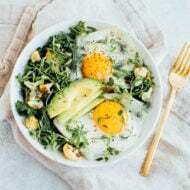 This meal is so delicious! Hearty, filling, and satisfying! Great recipe! !